Ohio coal miners support Romney | can i just finish my waffle? This will bring tears to your eyes and joy to your heart. This is was last Tuesday – just now seeping out. This would make a nice news story, wouldn’t it? I would have been interested in hearing about it, but it’s not something the corrupt obama media would want anyone to know about. This is from Gateway Pundit. Posted: 08.19.12 A. D. @ 10:24 p.m. I sense it, too. Romney landslide! Pingback: Obama Who? 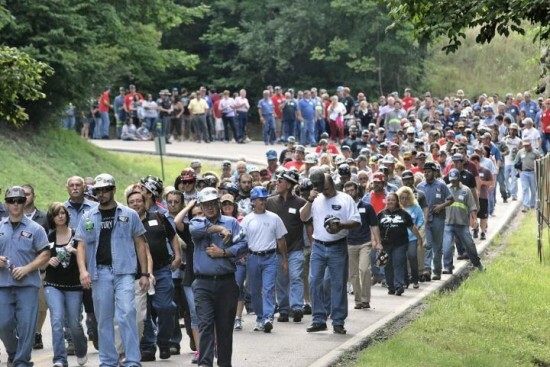 Ohio Coal Miners Rally For Romney! | I'm a Man! I'm 41! I think the media is lying about how close Romney and Obama are, especially in swing states. The want to keep it “close” as they did with the Scott Walker recall election. They kept it a phony tight race right up to the last minute.